Exploring possibilities that suggest what kind of innovation might be undertaken and why may lead to a strategic intent to further develop an idea or a suggestion for enhancement of current practice. 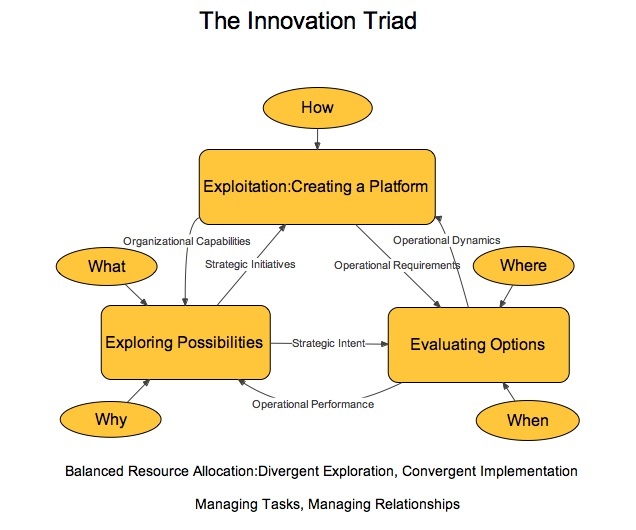 Evaluating options including where and when an innovation may be supported may yield additional ideas to explore and identify the operational dynamics needed to extract value from the innovation. Determining how to best exploit a particular innovation builds a platform for growth, delivering enhanced capabilities to support further innovation and identifying further enhancement of the innovation to be evaluated. This pattern may be observed both at a macro-level across the whole innovation journey and within one stage of it (e.g. technology development).